Few steps to plant a rose bush correctly. Nowadays, we sell the bare root roses ready to be plant. Prune is not needed. Before planting a box rose, it is necessary to prune the branches about 10 cm. 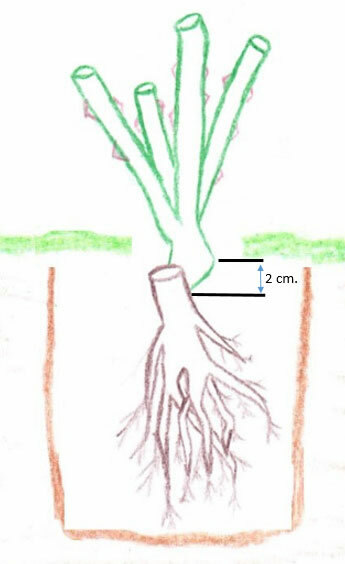 The roots do not require any additional prune. It is strongly recommend not to plant a rose bush near a tree. It is also important choosing a sunny site to plant it. The roses can live in any type of soil. However, the best soil for the roses is the clayey soil. In case the soil it is too much thick, it is proper to blend some sand. Moreover, some peat moss or vegetal soil can be blended in order to enrich the original soil. The hole dimension should be around 40x40x40 cm. The graft must be buried 2 cm. The graft is where the roots and the branches are joined. During the planting process, it is advisable to put pressure on the soil, in order to ensure the rose is strongly fixed and no air can be strained to the roots. Once the rose is planted, it must be watered. The recommendable distance between two rose bushes is around 80 cm. to 1 m. in case of planting short roses bushes. This distance increases until 1,5 m. when planting climbing rose bushes. The distance in case of miniatures rose bushes is 30 cm. Floribunda rose bushes needs a distance of 80 cm. or just 50 cm. if you use they to create borders.